I wasn't able to watch as many new movies last year as I would have liked, but most of the ones I saw were great. Without further ado, here's my list (in no particular order). Once you get over the fact that it's basically about a sexually transmitted disease, it is an awesome movie. The soundtrack takes the feeling of dread to the next level and this is the only movie in the list that made me lose sleep. Check out our review of It Follows, here. We've had pretty good luck with horror-comedies lately and this is the cream of the crop. This movie is basically a Real World episode about vampires. I cannot stop watching it. Check out our review of What We Do in the Shadows, here. This movie is unlike anything you have ever seen, even the category 'vampire western' is unique. It's a beautiful black and white movie with a great soundtrack. If you haven't already, listen to our podcast episode where we cover A Girls Walks Home Alone At Night. This haunted house movie set in 1979 feels authentic. It made me jump at least a few times and had some fantastic special effects. Check out our review of We Are Still Here. I didn't have high hopes for M. Night Shyamalan's new movie, but after seeing the trailer, I had to give it a shot. I could not have been more pleased. Creepy fast-moving old people plus Kathryn Hahn is a winning combination! 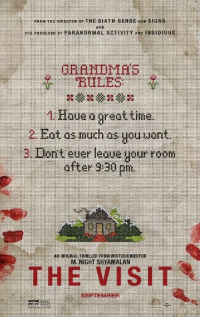 Check out our podcast review of M. Night's, The Visit. The acting is great and the creatures are pretty terrifying. It even features a creepy book like the Babadook. Well there you have it, folks. Here's to another great year of horror movies!